Pictures tell a story so much better than words can. We can SAY that we had an amazing brunch event and hosted 80 people and everyone had a great time. Or we can SHOW groups of smiling faces taking part in the event and having a great time! Ask before you click – Most people are ok and will even give you a great smile, but you want to make sure you have someone's permission to take their picture. Utilize your volunteers (or children) – Ask one of your volunteers at each event to be the event photographer. This will usually result in some pretty phenomenal pics and frees you up to do what you are there to do, which is connect with your neighbors. If you have children old enough to trust with your phone, task one of them to be your event photographer. Have your camera or phone readily accessible. Make it a priority – Don’t just expect the other team member to take them. Both team members must go into each event with pictures being a priority. Don’t forget to post your photos on social media! Tag them with #CARESteam so the rest of our community can see and share your photos. During an event, the last thing on your mind when you are filling ice chests, flipping pancakes, or connecting with residents is taking pictures, but afterward, you will be so glad you did. We LOVE seeing community in action, and we love to find ways to share the amazing things happening on your property! Would you like more information on what it means to be a CARES Team? Visit our website today. You can fill out a quick info form and someone will contact you with more information. Or, if you know of someone who would make a wonderful CARES Team member, REFER A FRIEND and be eligible for our referral bonus up to $200. Don’t forget to follow us on Facebook, Twitter, and Instagram (@aptlife) – and use the hashtag #CARESteam. CARES Teams are always looking for ways to stretch our budgets by getting vendors involved in what we do. As a CARES Team, our value is maximized by hosting creative events and getting a lot for a little. Getting vendors involved can seem like a daunting task, but with the right preparation it shouldn't be hard at all. Tour the city and local retail. Take one Saturday per month and spend a couple of hours just hunting down potentials. Look for restaurants/retail that is opening soon or just recently opened. They are usually looking for creative ways to market their product – and we can give them just that! Go into existing restaurants and retail and CONFIDENTLY sell what we do and how we can PARTNER with them. Template provided below. Take a look at city websites, village retail newsletters, Facebook pages, and city newspapers to see if there are any events coming soon that you can piggyback on. Many times they are free and fun, and you can just add value. Some CARES Teams have piggybacked on 5Ks by providing branded shirts for anyone in the community who wants to run in it. Community concerts in the parks are always fun as well. Look for timely partnerships. For example, after a severe storm, contact the local auto hail repair shops, and let them know that you would be happy to give them exclusive access to your market in exchange for hosting/and or catering an event. Let them attend and pass out collateral. One of your biggest vendor advocates is going to be your cable/internet provider rep. They will almost ALWAYS help fund at least one event a month because most of the time, the properties offer a monopoly. Our rep sponsored a $2,000 event to help sell one of his products. He raffled off Amazon gift cards and even gave away a 50 inch flat screen TV. All we had to do was let him in with his salespeople to try to convert residents to their product - a win-win for us both. Use your personal connections within your web of influence. Many of us have tons of friends in our life circles. Some are business owners who would be willing to pitch in financially to market their product. Networking within your circle of friends can sometimes be the best thing you can do. Most people are happy to get to be a part of what we are doing so they will go leaps and bounds to help us out because they love us. They may even have amazing ideas that we haven’t thought of. Talk about what you do. Ask people for help and ideas! Ask your Program Director and/or other regional CARES teams for contact information. If you already know the Marketing Manager’s number for the vendor, you don’t even have to go in to the place, you can just call. When you score a vendor, share the information with the other CARES teams in your region. Begin keeping a list of vendors and contacts for each vendor so you can continue to use them down the road. Timing is important: Keep timing in mind when you're going to a place of business. Are they always super busy on Saturday night? If so, that's probably not the ideal time to go in and ask to speak to the manager. As a general rule, restaurants have a "down time" between 2-4 p.m. If you can go on a weekday, that would be ideal. If you see a line out the door, it's not a good idea to wait in it and then ask to speak to the manager. If the vendor is busy, make a note to come back, or ask when the best time to come back to speak with the manager is. Look professional: Wear your name tag. Take your business cards. Wear professional clothing and get a sitter for the kids. If you look the part, they will take you more seriously. Be confident: Many times our CARES teams get this idea that if vendors help us out with events, they are doing us a huge favor. That is just not the case. We are doing them a huge favor by allowing them exclusive access to a closed off market, many times in their own backyard. For example, if your property has 275 units, this represents a market of 500+ people in the area, and you are literally handing them access to that market. They don’t have the opportunity to door hang on your property. You can give them a month’s worth of free advertising by placing their logo on your monthly calendar and promoting their product on Facebook, email blasts, text blasts, Instagram, Twitter, and however else your property promotes events. Create a mock calendar/flyer: Create a calendar using our templates that already has their logo on it and a flyer that you can take and physically show the vendor how you will promote their product. This will make getting a “yes” more likely because you are showing them professionalism. You are showing them the benefits of partnering with us and value in the partnership. We can tell them until we are blue in the face to no avail, but when you show them, it’s a whole new dynamic. • Facebook shoutouts: Apartment Life has begun giving periodic shout outs to vendors who have partnered with us at events on our company Facebook page. With more than 17,000 Facebook fans, this alone gains them a lot of exposure! Ask to speak to the manager on site. Generally they will ask what you would like for your prizes. Know what you will ask for before going in. Whether you have a large or small budget, these tips and tricks may help you go the extra mile and make a great event an unforgettable one. --Written by Jody Anderson, Program Director for North Texasand an active CARES Team with his wife, Natassia. The craft stores have had Christmas decor up since about June. Really. We won't talk about how way-too-early, or not, that is. Either way, there are LOTS of green and red when you see decorations for Christmas, but isn't there more? I'm so glad you asked! 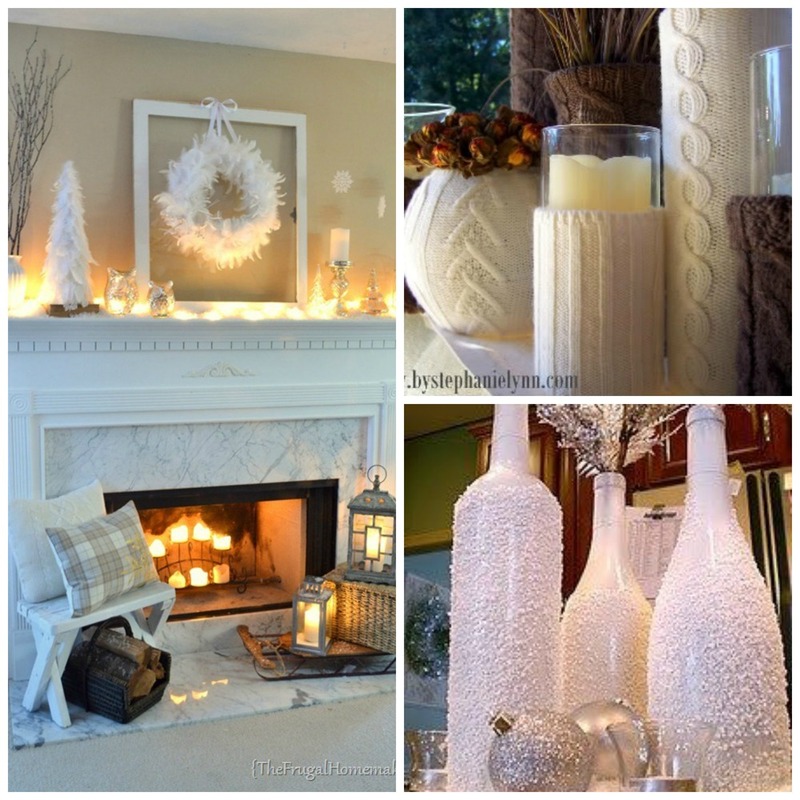 I'd love to show you lots of different ways to stylize all of your winter events. I hope these ideas spark some of your own! Be sure to check out our Winter Events Pinterest board for lots more looks, recipes, and drink ideas for your winter-time events! Have you heard of Walmart's neat new app for your phone? It's called Savings Catcher. You scan the receipt when you leave the store and if there are better deals for what you bought in the area, it gives you the difference on a gift card! What?! Helping you save money?! Yes, please. All you have to do is scan you receipt! It will save money by giving you money back AND it will save you time by not having to store-hop. We should have a debate about which is truly more valuable - money or time. *Apartment Life does not endorse or partner with any stores. Whether you already have fabric scraps lying around, or if you snag a coupon and run to your local fabric store, this bunting requires no sewing and leaves a big impression. This is a great project for kids to help with - just pop in a movie and start cutting scraps and tying them onto a piece of twine. Here's a great tutorial to walk you through the steps (Note - this can be time consuming if you're doing it by yourself. Also - be sure to tie your knots properly so they scraps lie flat). This bunting was made for... wait for it... LESS THAN $4! That's music to these budget-conscious ears! If you don't sew, this paper bunting tutorial will have you creating decorations in less than an hour. For a new spin on a traditional decoration, instead of using ribbon or twine, use washi tape to connect your bunting. This tutorial combines two of our favorite things - washi tape and burlap (swoon) - and is another fast, budget-friendly project for you busy party planners. 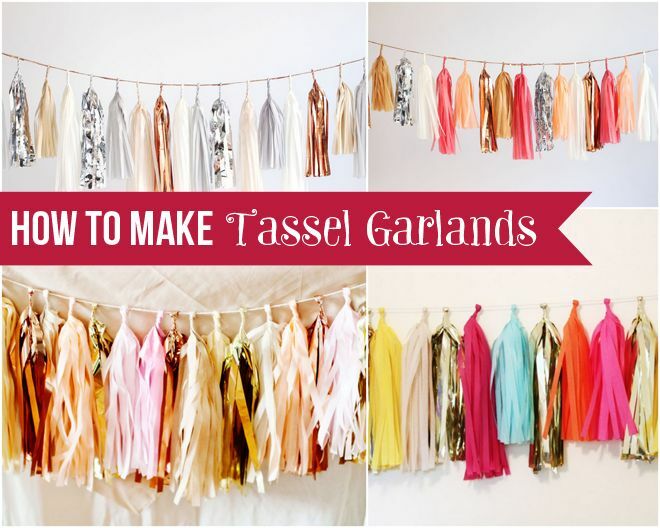 Tassel garlands: they're just so chic, aren't they? Here's a great tutorial that will show you how to turn a stack of tissue paper into a tassel masterpiece. You can experiment with different types of tissue paper, adding sparkles, shine, and fun colors to take that high-end event to the next level. If you're not afraid to do a little simple sewing, these mini garlands are easy to make and can be stacked and combined to create some fun combinations. You can cut your shapes out of scrapbook paper, construction paper, or felt, and combining different textures will add a new visual dimension for your guests. This may be the simplest way to tackle bunting - simply cut out your triangles, punch two holes at the top, and string some twine through. Add more interest by using unique papers (hit up the scrapbooking section of your local craft store, and don't forget to use a coupon), a book of maps... even wrapping paper works great. 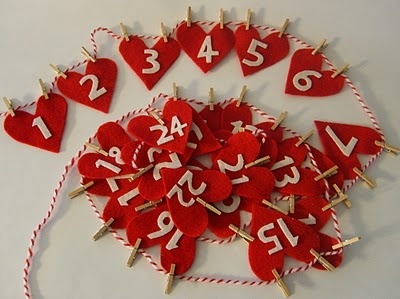 Another no-sew option for your bunting - you can use the mini clothespins or the full-size variety, and this option works with felt, fabric, or paper. We love these little hearts by this blogger. 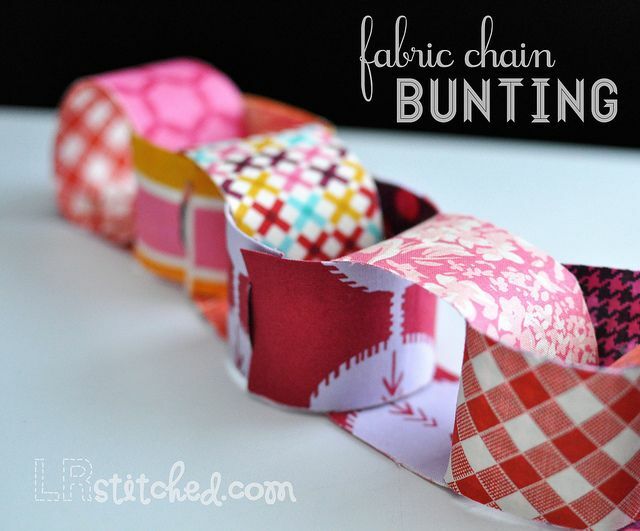 Raise your hand if you made chain bunting out of red and green construction paper for Christmas as a kid. Well, turns out you can do it as an adult, too! It becomes more sophisticated when you use pretty fabrics or scrapbook paper. Here's a tutorial. 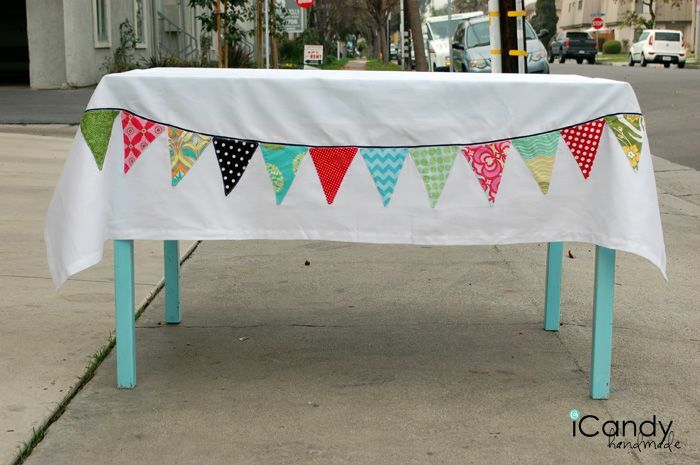 Make your traditional bunting nontraditional by using it in an unexpected way... like on a tablecloth! This one is for a beginner sewer, and can be re-used over and over and over (pick fabrics that could work with several different party themes to get a bigger bang for your buck, and time investment). Here's everything you need to get started. Thanks Pinterest for the cutest idea ever. The coffee filters add so much pretty texture, and it's perfect for our Princess Party or something else with a feminine theme. Food labels are one of those little touches that can leave a big impression on your guests. It's like a topper on the cake - the cake is going to taste amazing, regardless of the decoration, but adding something really awesome to the top adds an element of "wow." Besides, in this age of food allergies and picky eaters, your guests want to know what it is they're eating. So let's kill two birds with one stone (note: We do not advocate killing birds... but we do advocate awesome parties.) and come up with some fun food labels. 1. Butcher paper: We love butcher paper. Our CARES Teams love butcher paper. And every teacher in the history of the universe has loved butcher paper. You can order it by the roll on Amazon and use it again and again for your events. It fits just about every theme, and creates a fun, trendy feel to give that monthly pancake breakfast some extra sparkle. 2. Reusable picture frames: Frames are so versatile: You can paint the glass with chalkboard paint, or insert pretty scrapbook paper behind the glass and use a dry erase marker on the glass to label your food. 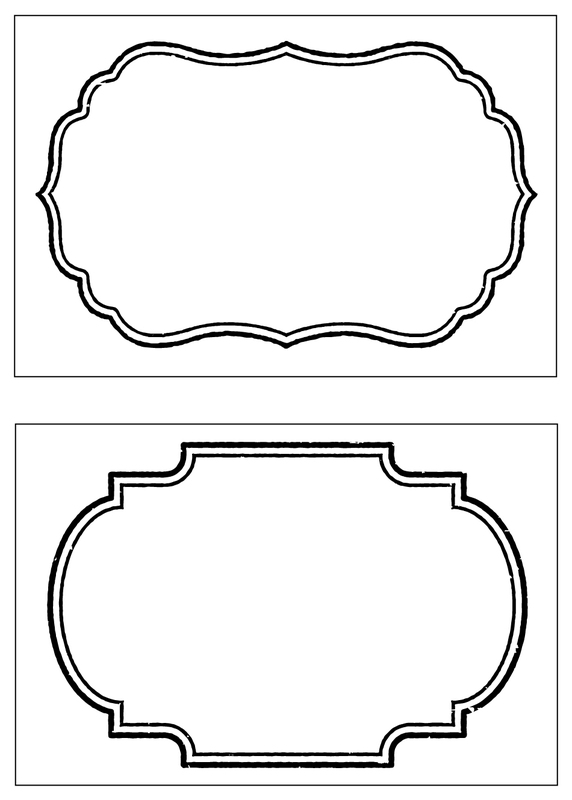 Or, you can design and print your own labels on your home computer and simply slip them behind the frame. Purchase neutral frames that can fit with your many themes, or snag some from around the house and mix-and-match for an eclectic feel. 3. Clothes pins: They're inexpensive (my love language) and can add height and interest to your printed cards. And, the best part - you can use them over and over and OVER. 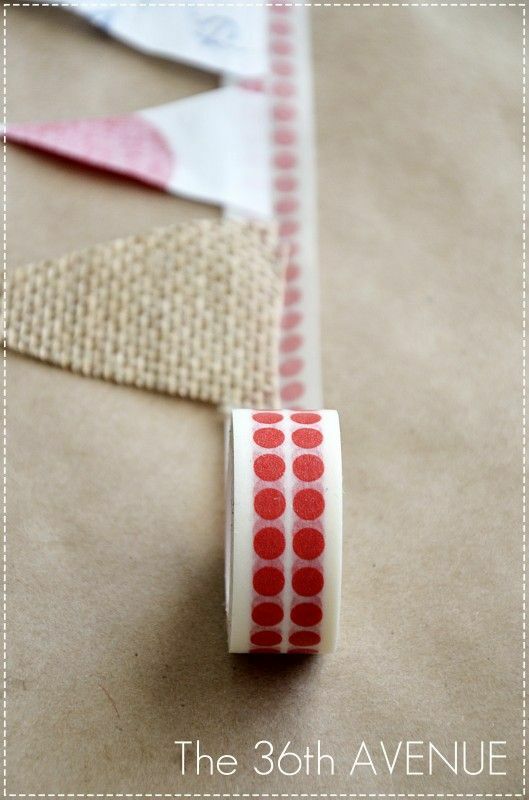 You can spray paint them, bedazzle them, cover them in washi tape... there are so many great ways to dress them up, but even plain, your guests will love them. Now... for the free stuff. I like free, don't you? 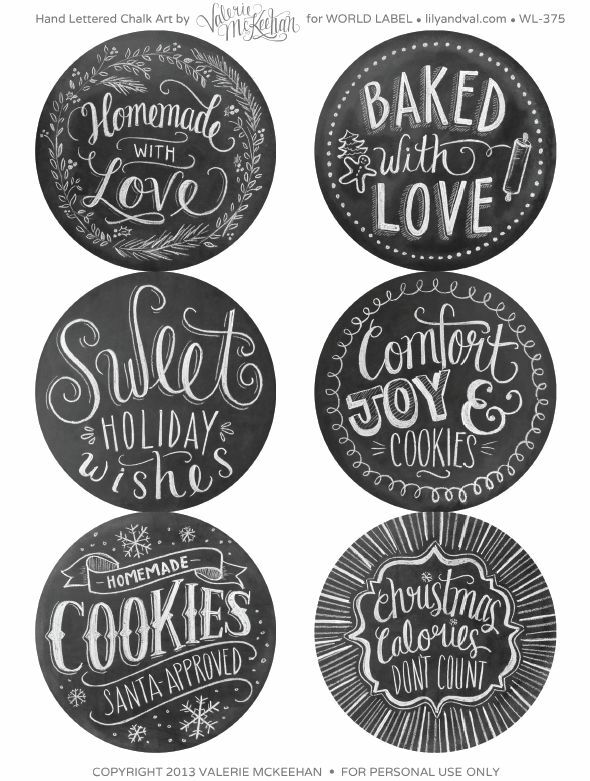 Here are some free printable food labels from around the web! The bottom line: keep it simple, inexpensive, and re-usable. Happy labeling! If you're trying to throw a fabulous event on a shoe string budget, then you've got to get creative with your decorations. Going BIG with balloons can add color and fill the space without emptying out your wallet. Whether you go with traditional groupings or try something new, just remember that your centerpieces should either be low enough to see over, or high enough that your guests can still talk across the table without craning their necks. After all, good conversation is the most important goal of the party, right? Create a dramatic backdrop for your food table by attaching a large number of balloons to the wall. Whether you choose to go monochromatic or employ a variety of colors, it's an easy way to grab your guests' attention. These also work perfectly for a homemade photo booth backdrop. With jumbo balloons, a little (excuse the pun) can go a long way. This is a simple way to think outside the box. It works great for an outdoor event, or string them in a doorway or hang behind your food table. It's not just for junior high dances - everyone loves a ceiling full of balloons. You can use helium, or dangle them from a string. It's an instant way to set the mood for fun. 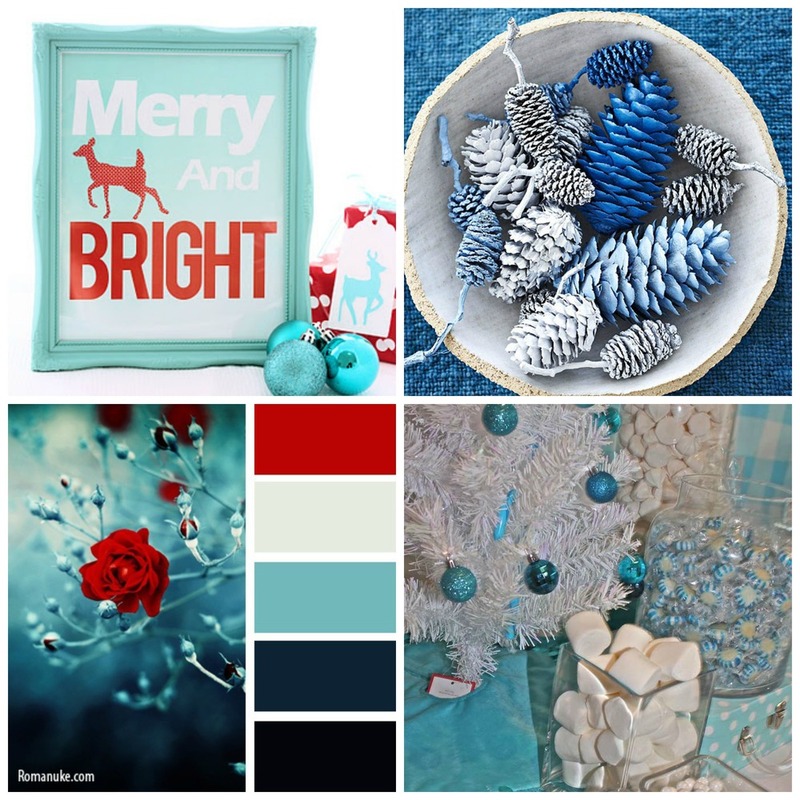 For more ideas, visit our Decorating with Balloons board on Pinterest. Apartment Life desires to be the change within apartment communities and exists to foster environments where apartment residents can build quality relationships with their neighbors through a renewed focus on community. Are you an event expert who is interested in becoming a CARES Team? Find out more here.